....Worth noting again - my dad's results came back cancer free. & he's home & healing up nicely! & by nicely, I mean he's back to eating. Success! .... My mom .... Ever since her "non" stroke (they don't know what happened to her & why her eye is closed & her mouth was drooping).... but her eye opened up Tuesday!!! ... the flower arrangement my mom sent to the funeral home had a cross in it - perfect for our cross wall in our home. I love when our crosses have a personal meaning behind them... this one will be precious to us. .... Our neighbors.... in the snow, our driveway would take FOR-EV-ER to hand shovel, but I got home from work to find our drive has been plowed & cleared off for me to get from the road straight to the garage. I honestly can't express how much that means to me... I may not shovel it myself (my shoulder, I can't) but I sit there & worry about Ricky having to shovel after walking 15 miles for his work day.... know that part in the Bible that says, "Love thy neighbor"? We got that covered! .... No Snow this week!! I'm so over snow!!! We may have the cold to deal with still for the next few days, but as long as there's no more snow, I'm good. .... Going along with that idea - thankful to see pavement again. Most of the roads are FINALLY getting cleared off. I literally can not walk on snow & ice so this clutzy girl is so happy to see the asphalt shining through. .... My first Dunkin Donuts Iced Coffee. It wasn't bad. It wasn't "McDonald's" level iced coffee, but it was way better then Starbucks version. & its something I can run out & grab at lunch on beat up afternoons. .... Filling up my car before gas rose 50 cents in one afternoon. How does it raise that much in an hour? I don't get it. .... still thankful that even at its highest right now ($2.49) its still lower then $4.00 a gallon. .... Hobby Lobby. I had to wait after work to meet up with Ricky to go to the funeral home to see Ricky's sister, Pam & her husband. What better place to wait then Hobby Lobby? Ricky said he was trying to hurry.... no worries. Give me all the time you need as long as I can stand in all things yarn & crafty. ... a surprise at the door. We got home last night & had a box at the door. Opened it up & saw this beautiful stepping stone that our youngest had sent since she couldn't make the funeral (lives in Iowa).... Ricky & I both had our mouths just dropped. Isn't it beautiful? As soon as he pulled it out, I saw that it was engraved with the name & date.... oh my goodness... how precious. Oh, my. That stone brought tears to my eyes. Yay for your dad eating!!! Our main roads are clear; they did a good job with plowing and treating the roads. We live in a main road, and it's just wet; I think we got about 4 inches last night. I've had Dunin' Donuts coffee once and wasn't impressed. Our roads have been clear for a while (thanks in no small part to a couple of days > 32 degrees), and hopefully the forecast will hold for today's snowfall (less than an inch). What concerns me is the ice that's in the forecast for Tuesday. That stone is so precious. First of all, I just want to say thanks again for doing Thankful Thursday. When I started thinking this morning about a post, it was like I couldn't think of anything to write. Then as I was perusing FB and Instagram some verses of scripture were there and it's like they were just what I needed to hear this morning. So my post is completed and I'm linked up now and I feel better ready to handle this day after realizing there is lots to be thankful for. Seeing your Instagram Post of your "She Reads Truth" study was when the lightbulb came on. Thank you. That stepping stone is beautiful! And I agree, I'm ready to see this snow and ice be gone! Days like yesterday are wonderful. It was cold, but the skies were blue and the sun was shining. Love it!! God is soooo good!!! 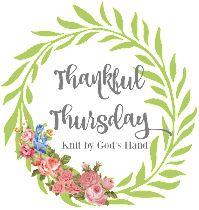 Again, thank you for Thankful Thursday. I feel so much better now! How sweet for the gift your brother sent you! I love that! I enjoy reading your blog. I think you are a beautiful person.. You inspire me! I am so sorry to hear about Mike. I send my condolences to you and Ricky and the rest of the family. I hope you all can find some peace soon. I love that stone ! How thoughtful ! that is so sweet for that stepping stone. i know that meant a lot and will hopefully bring comfort to you both. oh my goodness...that stepping stone is beautiful! such a lovely quote!